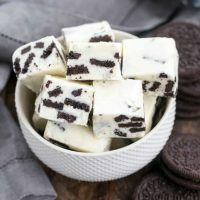 Oreo White Chocolate Fudge AKA Cookies and Cream Fudge takes the classic No-Fail Fudge recipe in a new delicious direction! White chocolate lovers will adore this easy peasy confection. In this neck of the woods, I’m famous for a few sweets. Namely, my Classic English Toffee, Chewy Gingersnaps and my No-Fail Fudge. The fudge recipe is on the back of the jar of marshmallow creme, so it’s no big secret, but I do have a few tricks to make it perfect every time. 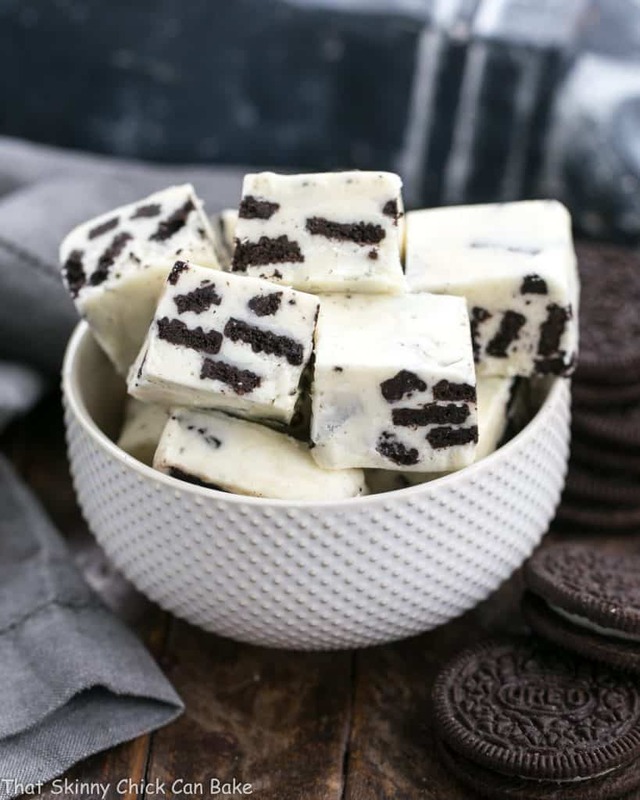 This Oreo White Chocolate Fudge is a simple riff on the popular no-fail chocolate fudge recipe. White chocolate instead of semisweet plus some chopped up Oreos. 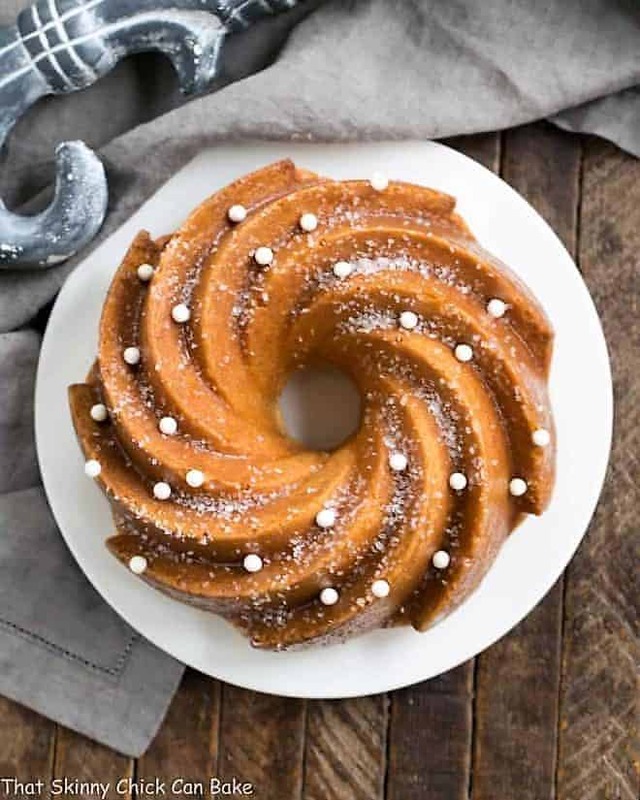 The family went crazy for this easy confection! 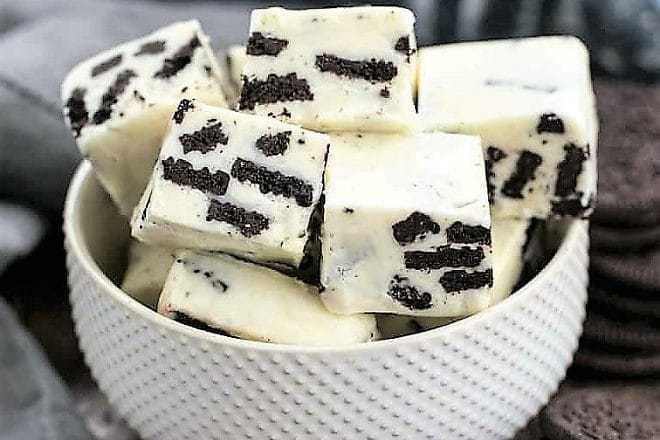 This Oreo fudge is super simple, but to ensure perfect results, you’ll want a candy thermometer. The original recipe has you boil the sugary mixture for 5 minutes, but it’s hard to know exactly when to start timing. When it starts bubbling??? Or when its come to a rolling boil?? If you’re willing to invest in a candy thermometer, it will make the process a little more precise. You boil until the thermometer reaches exactly 234°. Plus, you’ll be able to make my toffee, caramels and even fry chicken at the proper temperature with an accurate temperature gauge. Besides using a candy thermometer, I also like to pop the lid on the pot just as the mixture starts to boil. That helps melt any stray sugar crystals which could possibly recrystallize if not completely molten. But keep the lid on for less than a minute so you can keep good track of the temperature. Adding marshmallow creme may seem odd if you’re used to your grandmother’s recipe without any processed ingredients. It plays an important role, though, as it prevents the melted sugar from recrystallizing. This addition is key to making this a true no-fail fudge! Welcome to Progressive Eats, our virtual version of a Progressive Dinner Party. 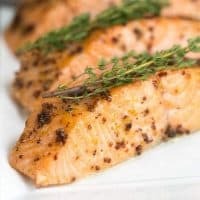 Our menu this month features terrific cocktail, appetizer, entree, and dessert recipes fit for a romantic Valentine’s Day dinner! All perfect for your entertaining needs during the holidays! Hosting this month is Jane from The Heritage Cook. 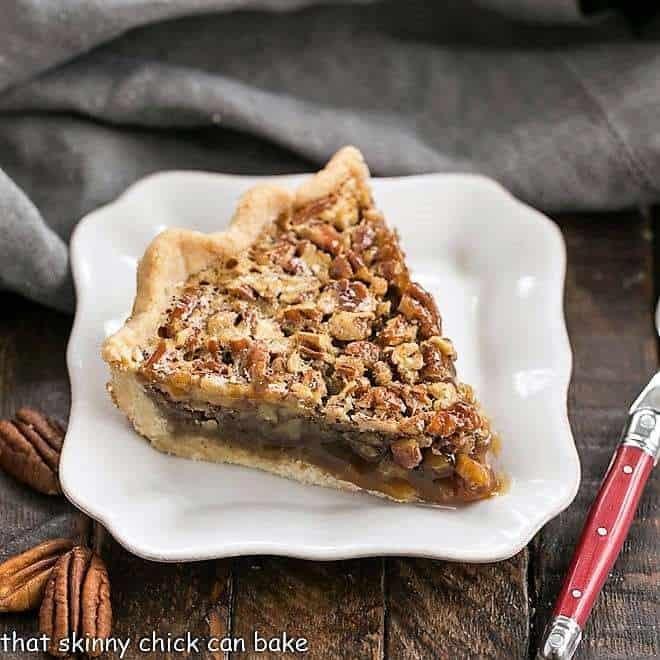 8 x 8-inch baking pan – a terrific pan for fudge, brownies and a lot more! non-stick foil – I use this to line my baking pans! Makes for easy removal and clean up. Check out my Delectable Desserts and Holiday and Seasonal Recipes Pin Boards for more Valentine’s Day inspiration! 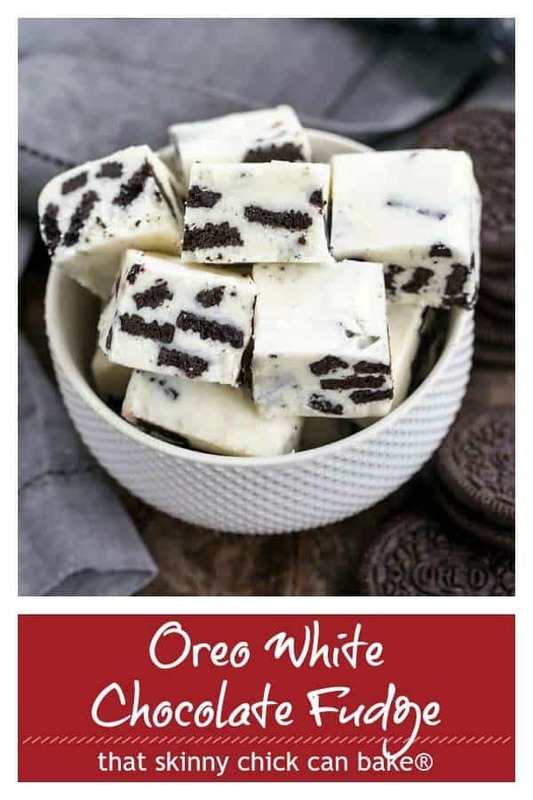 Oreo White Chocolate Fudge AKA Cookies and Cream Fudge takes the classic No-Fail Fudge recipe in a new delicious direction! Line an 8 x 8-inch baking pan with non-stick foil. Set aside. Melt the butter in a medium saucepan. Add sugar and heavy cream and stir to combine. Heat until it’s almost ready to boil, then put the lid on for about a minute to help the sugar melt. Remove the lid, stir and insert a non-stick foil. Let boil, stirring occasionally until the thermometer reaches 234º. Remove from heat and mix in the chopped white chocolate and marshmallow creme, stirring until chocolate is melted and marshmallow cream is incorporated. Quickly add chopped Oreos, then carefully scrape hot mixture into your prepared pan. Smooth top with an offset spatula, then let cool to room temperature. Place in refrigerator, covered to chill before cutting. Those are for sure the calorie bombs..but definitely worth it! how much more decadent can we get wow these are yummy love love love! You are famous over here for those sweet treats too, in fact, I think you might be world famous!!! I have never used marshmallow creme but this fudge looks incredible! 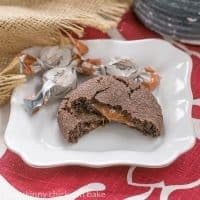 What’s not to love when using oreo cookies and chocolate in a recipe!? 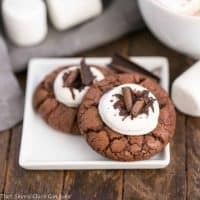 My daughter is probably gonna flip if I make these, which I will. These look so so good. I want to eat all of them! This is such a wonderful decadent dessert – especially perfect for Valentine’s Day! 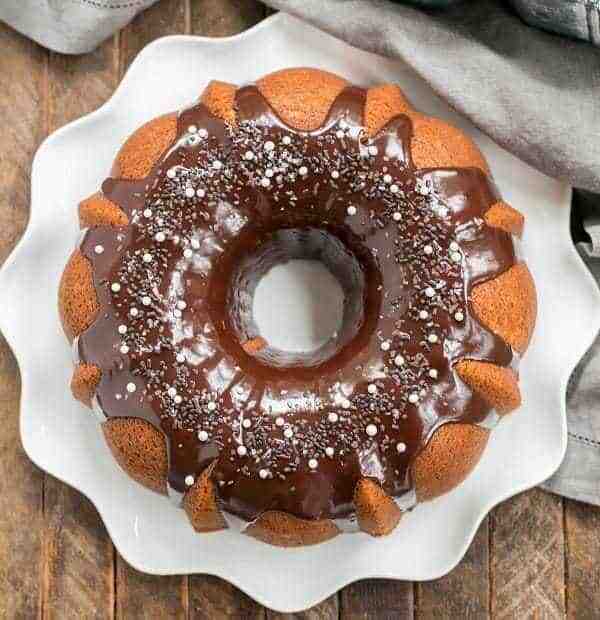 So beautiful and completely mouthwatering! 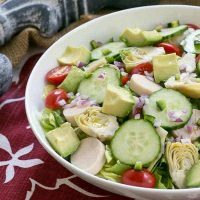 This is such a good recipe for kids and adult alike! Very easy to prepare (just that I need a candy thermometer 🙂 )and may be served in any occasion. Thanks for the tips in cooking too, Liz! Yum, and I am ready for dessert too! Yes a candy thermometer is a must in any kitchen. And great tips. I did a similar white fudge but with huge chunks of candied fruits I bought over xmas from a Portuguese grocery store. So pretty. Easy peasy and delicious! I love the Oreos and white chocolate combo. I’m thinking I need to make some to share at work! WOW! I’ve never made fudge and honestly I’m afraid that if I made a batch of these my honey would never see most of them. Hard to imagine a more fun version of fudge. These look terrific! Love the contrast between the black and white, and I’ll bet the flavor is out of this world. Thanks! That fudge wants me! 🙂 OREO anything rocks! YUM!! That fudge looks amazing Liz! I have never added marshmallow creme to my fudge before, and I can see how it makes a difference! Yummy! OMG! I can never ever make this. I would eat it all. 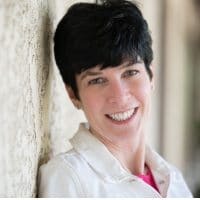 Love all your tips for success and your photos are luscious. Oreos? Fudge? Oh my. My heart is racing! Best dig out that thermometer! Once again, I think my finicky family would turn their noses up at these. I’d also have to have someone hide these from me. I have never tried fudge made with marshmallow creme before, I am definetly intrigued. WE loved this not a single crumb leftover! Anything with Oreo is an instant favorite in my house! I can’t get enough of this fudge! Too yummy! Just made this and OH MY! Everyone in the family loved it. So GOOD! 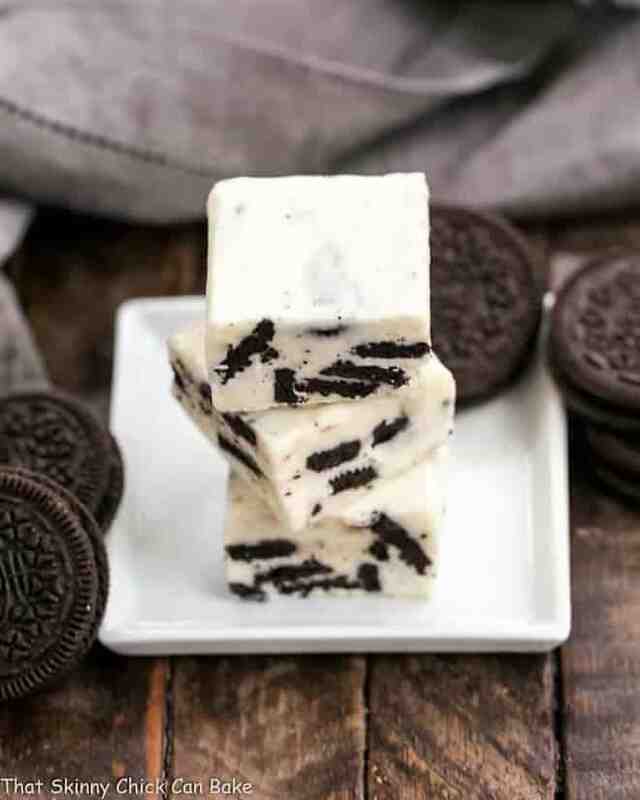 I love the look of this fudge, with the Oreos showing like that. Great recipe! My family would go crazy for this fudge too. My kids really enjoyed this treat! So good! So easy, and always a favorite! 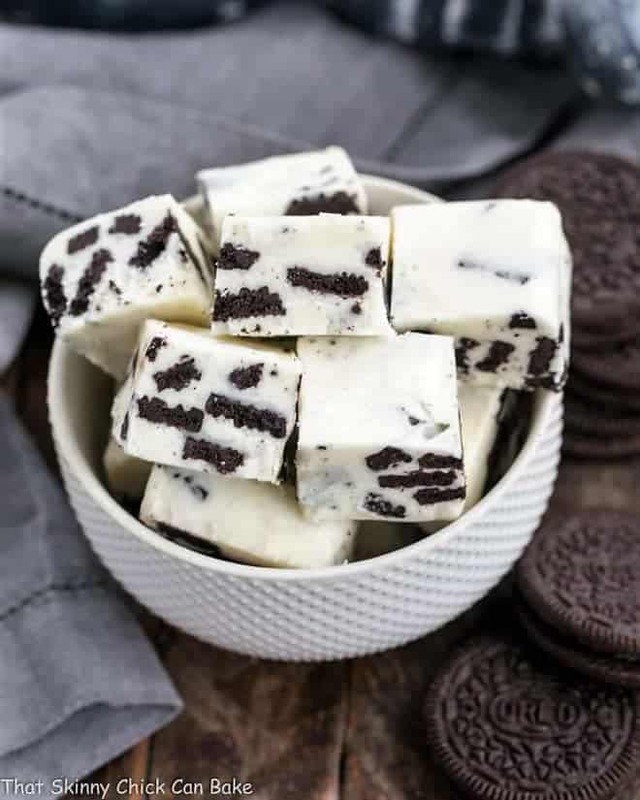 I am such a sucker for fudge and Oreos and now they are together! My homemade Christmas gift this year! Just made a batch to bring to a party tonight! Oh my goodness, so good! Yay! So glad you liked it! Merry Christmas, Jackie!! This was better than the fudge they have at Buccees!